WASHINGTON, DC, September 10, 2010 (ENS) – In Columbia and in Bolivia, two rare and threatened bird species are now enjoying an increased measure of safety due to partnerships the Washington-based American Bird Conservancy has created with local environmentalists and scientists. In Columbia, the Cerulean Warbler, one of the world’s most threatened migratory birds, is benefitting from the work of Colombia’s Fundacion ProAves and El Grupo Ceruleo. The groups have partnered with ABC to develop and publish a conservation plan for this bright blue songbird that flies from North America to South America every year. “This wonderful partnership will ultimately lead to more effective conservation efforts for a bird in real trouble,” said ABC President George Fenwick. And in Bolivia, habitat vital to the world’s most endangered macaw surviving in the wild, the Blue-throated Macaw, has been purchased in a joint effort to expand a nature preserve by three conservation groups – American Bird Conservancy, Asociacion Armonia Bolivia and World Land Trust, US. “Only about 350 Blue-throated macaws, including as few as 50 breeding pairs, are believed to exist in the wild, so expanding the reserve was vitally important to preservation efforts for this bird,” Fenwick said. 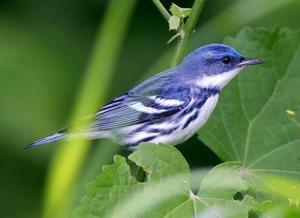 In summer, the Cerulean Warbler, Dendroica cerulea, breeds in the deciduous forests of the eastern United States and Canada. These brilliant blue songbirds migrate south to winter in their non-breeding range, the Andean montane forests of South America. Conservationists are alarmed that Cerulean warblers have lost 80 percent of their population over the past 40 years due to habitat loss and fragmentation across the species’ whole geographical range. The clearing of forests for agriculture and cattle pasture and conversion of traditional shade-grown coffee plantations to sun coffee plantations are among the main threats to the Cerulean Warbler in its non-breeding range. “We hope that, by identifying the threats to this bird and implementing mitigation strategies, we can help save one of the most spectacular migratory birds in the Americas,” said David Caro, executive director of Fundacion ProAves. “This plan will not only assist and guide efforts by individuals, institutions and groups on behalf of the Cerulean warbler; it will also benefit many other resident and migratory birds,” he said. The new conservation plan, published in the journal “Conservacion Colombiana,” relies on recent advances in the knowledge about the species’ geographical distribution, survival, and ecology. The partners intend to use economic and ecological tools, such as certification and economic incentives to reduce the loss of shade-grown coffee farms, to promote a protected areas network using the warbler as an umbrella species, and to restore and enhance habitats. A pilot project in Colombia initiated by ABC and Fundacion ProAves demonstrates the potential for shade coffee and cacao plantings to provide habitat for Cerulean warblers. The conservationists work with private land owners, encouraging them to maintain their lands as habitat for the warblers and other migrant and native species. In the United States, the Cerulean Warbler is one of the species of highest concern because of its small total population size and decline throughout its range. The bird is under consideration for federal protection under the Endangered Species Act. Globally, the species is listed as Vulnerable by the authoritative IUCN Red List of Threatened Species. The Blue-throated Macaw, Ara glaucogularis, is found in the wild only in the Beni Savannas of northwestern Bolivia. This complex ecosystem of grasslands, marshes, and forests is controlled by cattle ranchers who set fire to large areas for pastureland each year. Now, more than 2,800 additional acres of savanna and rainforest will be protected as part of the existing Barba Azul Nature Preserve, which is enlarged to encompass 11,555 acres. “By purchasing this land, we will be able to extend protection across the spectacular Omi river and create a more effective boundary against the impacts of cattle ranching, while incorporating more crucial blue-throated macaw habitat into the reserve,” said Mauricio Herrera from the Armonia/Loro Parque Fundacion Blue-throated Macaw Conservation Program. “The enlarged reserve now protects five important Motacu palm forest islands. 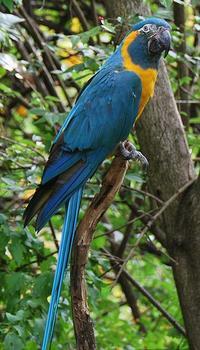 The Blue-throated Macaw depends on the oil-rich fruit of this palm tree for its survival,” Herrera explained. The Armonia/Loro Parque Fundacion Blue-throated Macaw Conservation Program has been working to protect the Blue-throated Macaw since 1995. The Loro Parque Fundacion of Spain is a nonprofit organization operating internationally to promote conservation of parrots, biodiversity, the environment and sustainable development, and supports the Blue-throated Macaw Conservation Program. Asociacion Armonia is a Bolivian non-profit bird conservation organization that manages the Barba Azul Nature Reserve. Searches over the years located only a few clusters of these macaws scattered miles apart and often nesting on massive ranches worth millions of dollars. Conservationists realized that protection of any one of these sites would not be enough to save the endangered species. 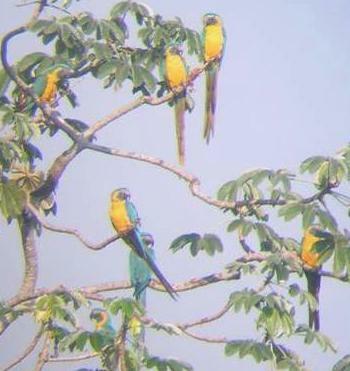 With funding from American Bird Conservancy, a survey of the most remote areas of the Beni Savannas found a thriving colony of Blue-throated Macaws, at least 80 in number, that had been overlooked by poachers. This isolated area, spanning nine private ranches, held the world’s highest abundance of Blue-throated Macaws. By coincidence one of these ranches was for sale. Within months, World Land Trust-US and American Bird Conservancy raised the funds and in 2008 acquired the first parcel of land for the Barba Azul Nature Reserve. Barba Azul means blue beard in Spanish, and is the colloquial name for this endemic Bolivian bird. The preserve also protects other threatened bird species and provides habitat for jaguars, peccaries, pumas, giant anteaters, pampas deer, black caiman and maned wolves.